[New for Late 2015] I will freely admit that I am jealous of everyone who has already found this flavor. I mean, it's holiday inspired, cinnamon is involved, and I need it in my belly, like, right now. Ahhhh, so pretty when scooped. It smells of.... well, snickerdoodle! A little frosting swirl first maybe... and then the cinnamon swirl. Hmmmm. Ok, there's a whole lot of crazy going on here. Need to process all the grit and dough and sugar and swirl and sweetness and.... First impression of this flavor? It's crazy. There's just a lot of textures and flavors and nonsense going on here. I'll be honest, it kind of feels like some kid ate took everything from the Christmas dessert table and just I can't say that smashed it all together. I've become a lot more tolerant of cake flavors over the years, and their incessant sweetness, but this is borderline gross. I'm sorry. People seem really psyched about this flavor but the frosting is dominating the cinnamon graham and the cookie dough. They are there, but they are buried under all the sweetness. As I try to finish the bowl, I really wish that this was two separate flavors instead of one jumbled mess. Yes, the cookie dough seems plentiful. Yes, it amuses me that the sprinkles still crunch. But I really wanted the snickerdoodle vibe to be stronger. I've had snickerdoodle swirl before and it's epic. 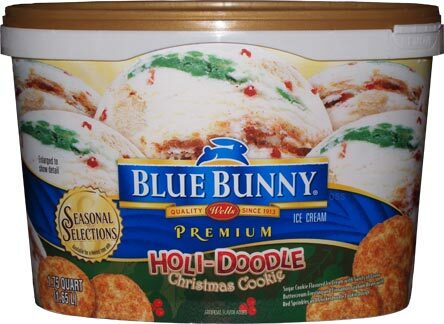 If anything, I've now lost the urge to try Blue Bell's Christmas Cookie ice cream (maybe I'll follow CT's lead and make myself a milkshake tomorrow). Final Note: I don't know if maybe they just didn't order enough of this one, but it quickly vanished from my local walmart while there is still a ton of their Pumpkin flavor left over. A little surprised you didn't like this one. It did sound like an overload but in a good way; have to wait to taste it for myself. Blue Bell's website does not list Christmas Cookies as one of the (few) flavors it is currently making during its return to the market. I loved that flavor, and it was a bit of an overload, too. Until I read this post I totally forgot Blue Bunny existed! They used to be my top 3 brands I looked at when I went to ShopRite but once they shrunk their half gallons, they seemed to all but disappear! Any ideas why Dubba? @D: They've been very quiet this year, not 100% sure why [I've asked, they won't tell me]. 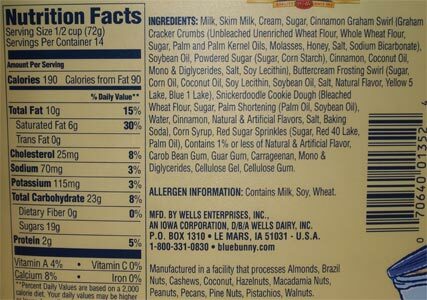 It's sad to say there are people out there who think Blue Bunny is actually Blue Bell in disguise. Jeez! Look at that ingredient list! It's like a menuboard of every artificial and chemical additive out there. That's not ice cream. Ice cream is cream, milk, eggs, and sugar. That's some kind of frankenfood there. Perhaps it's just my family and I being an absolute heathen when it comes to sweets, but I couldn't get enough of this flavor! In my house it hardly lasted two days, we loved it! Super super super sweet! We went into it not expecting snicker doodle, so perhaps that's why you found yourself disappointed; we were looking for an upgraded icing/birthday cake flavor, and this certainly delivered with fun elements added to the mix ^-^ Not dense or premium (what can you expect for the price), but definitely had all the flavors I was looking for this season! @D...: Yeah, it's very long, and I wish it was simpled, but keep in mind there are a ton of different things going on. @Caitlin: Good call, I can totally see cake fans digging this flavor. @D...: technically the gums could be in different items, but yeah, totally agree, I think it's what is preventing me from enjoying this one. Unfortunately Straus doesn't appear to be in my area. I'm a purist when it comes to ice cream. 3 flavors with the least ingredients is all I need in life. Having said THAT, if I'm not eating ice cream I'm eating cookies and cake during the holidays. This ice cream is CRAZY CRAY CRAY GOOD!!!! Like if you took a crunchy sugar cookie (my fav) and frosted it and loaded it with sprinkles and froze it. Texture explosion! Seriously this ice cream is for people who pig out from Oct. to New Year's. NOT for the rest of you. I didn't mind this one but those sprinkles were a little too crunchy for me. I guess I expected them to feel like chocolate chips because of the dough pieces but instead the sprinkles felt like sand and not chomping on them didn't feel right. 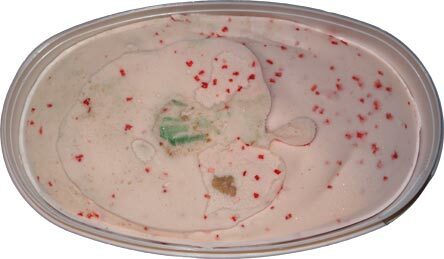 I absolutely looove Blue Bells Christmas cookie ice cream. Sooooo since its not available again in my area, I tried a substitution. I totally HATED this ice cream. It's crunchy, gritty and too sweet. The green frosting is just one big frozen hunk of sweetness and the sugar cookie flavor is overpowered by it. Every single bite is crunchy....uuuggghhh. Blue Bell, I sure do miss you. 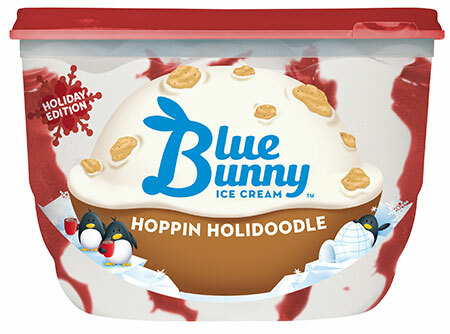 And Blue Bunny, please don't bring back this flavor next year. Yuck! 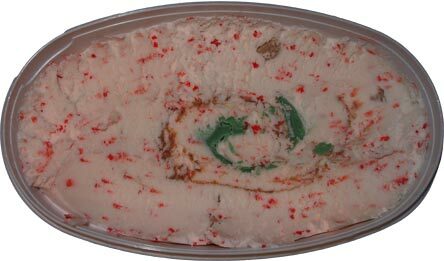 My family has described this flavor as "Christmas in a bowl!" My daughters, all 3 and their husbands too all love this flavor. Yes it has varying textures and sweetness but it works. Not a flavor I'd eat all of the time, but as a treat during the holidays, it's perfect.